What's up with those little pesky bones down the center of the salmon fillet I just bought from a fish shop? Sometimes they're there, and sometimes they aren't. If I try to pluck them, my kitchen pliers only mangle the rest of the fillet. If I cut them out, I'm left with a piece of fish that looks like it should be served on the kiddie plate. And if I leave them in, Tom Colicchio is going to skewer me, and Padma is going to tell me to pack my knives and go. But she'll look good doing it, right? Sounds like you're not afraid to get medieval on your food, which has its place, but working with fish requires a gentler touch. The pesky bones are called "pin bones" — or “intermuscular bones” when you're hanging with your zoologist pals — and they're found in many popular fish, especially salmon. Filleting a fish removes the flesh from the main skeleton (backbone and ribs), but the pin bones are “floating” bones, not attached to the main skeleton. Chow has a helpful video about removing pin bones. According to food-science writer [/books/collections/all_books/On+Food+and+Cooking "Harold McGee"], the purpose of pin bones is to “stiffen some of the connective-tissue sheets and direct the muscular forces along them.” And to annoy cooks. Pin bones are relatively soft and harmless, but it's definitely not classy to serve them. So what to do? If you have a nice fishmonger, you can request fillets with the pin bones removed. If you have super-duper fishmongers, they may even remove the pin bones from every fillet they sell. This might be why you notice pin bones only some of the time, depending on where you buy your fish. With the proliferation of pre-packaged supermarket fish, however, you may not always (or even often) have that option. If you're stuck with a pin-bone-ridden fillet at home, it's not terribly difficult to remove them if you have the right tool and the correct technique. As you've noticed, fish flesh is easily damaged by rough handling. It also spoils quickly, so extensive messing around any longer than necessary at room temperature (and with warm hands) is not a good idea. To remove pin bones, first place the cold fillet skin-side down (usually the flatter side if the skin has been removed) on a cutting board. For style points, you can place the fillet on an inverted bowl, which spreads the surface of the fillet slightly and better exposes the pin bones. But it's one more thing to wash, and not really necessary unless you have trouble locating or pulling the pin bones. Next, grab your (clean) weapon of choice. Pliers are okay, but I don't love them because they aren't spring-loaded, so it's a pain to keep opening them to release the bones. At my house, they're also dirty and in the garage — two more strikes against them. Household tweezers can work, but they're tiny and sharp and tend to cut through the relatively soft bones rather than grabbing them. Also, you have to wonder where they've been, and I'd rather not think about that when I'm grubbing down on a salmon fillet at someone's house. My favorite pin-boning tool is a pair of inexpensive dedicated fish-bone tweezers, which retails for as little as $3.50. They're designed to securely grab pin bones without cutting through them, and then to spring open and release the removed bones easily. The pin bones lie in a line running lengthwise down the fillet, and you'll be able to feel their exposed ends with a fingertip. Pin bones don't project straight up from the fillet — instead, they're angled toward the head (wider) end of the fillet, running between the muscle layers. The most important consideration when removing a pin bone is to pull it along its own axis — that is, the direction the pin bone is naturally "pointing" — and it should slip out cleanly from between the muscle layers. If you pull the bone straight up, perpendicular to the cutting board, the delicate flesh of the fish will tear, and you'll have a rough time at the Judges' Table. 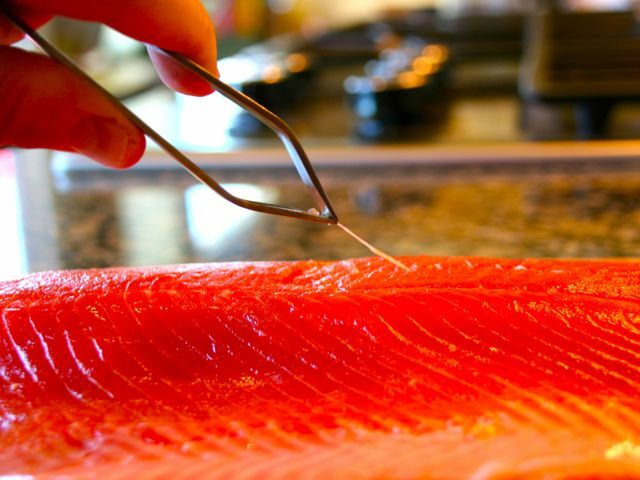 Get a good grip on the pin bone, and with the palm of your other hand apply even, flat pressure to the fillet. Extract the pin bone with a firm tug, and wipe your tweezer or pliers on a paper towel or damp kitchen towel to remove the bone. Once you figure out the correct angle, it'll be the same for the rest of the pin bones in the fillet. After the pin bones are out, immediately refrigerate the fillet, or season and cook it before it gets any warmer. 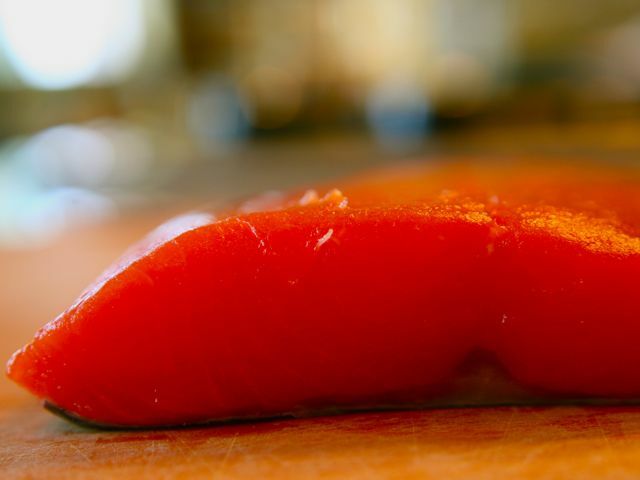 If you're working on a bunch of fillets and want to avoid frequently opening the refrigerator while you work, use the restaurant prep-kitchen trick of keeping the fish in a (preferably metal) bowl or tray placed inside a larger container of ice. Your fish will stay cool and fresh, and you can concentrate on impressing the judges. p(bio). Based in Portland, Oregon, Hank Sawtelle has engineering, legal, and culinary degrees.